Could this be lurking behind your walls? This image depicts several violations. We found these boxes buried behind the wall. 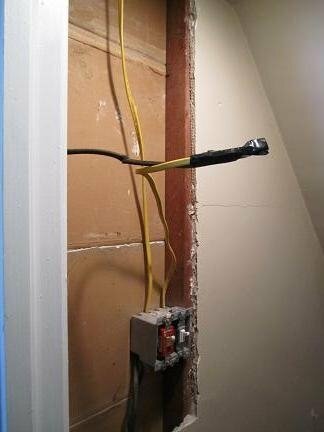 Junction boxes must be readily accessible. 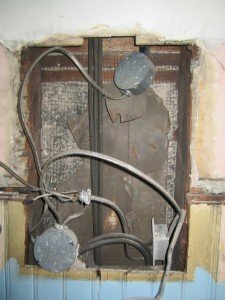 Extending knob and tube wiring can cause overheating of wires. 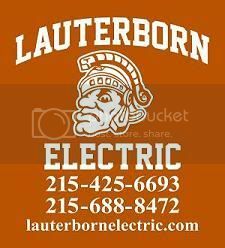 Many remodeling projects are done by general contractors who do all aspects of a project themselves (electric, plumbing, HVAC, etc) to save on costs. Have you ever heard the phrase “jack of all trades, but master of none”? Many general contractors lack the knowledge or know the codes pertaining to proper electrical installations. Would you let your car mechanic examine you when you are not feeling well? No, you would see your doctor on something as important as your health. Well, electricity not done properly could be a hazard to your health. The image above shows an improper splice inside a wall. A splice not correctly made could become loose and lead to lights blinking or a power outage. If this splice is buried behind a wall or ceiling (flying splice) it can lead to major problems. Flying splices can lead to intermittent or full loss of power if the connection becomes loose. This splice will be nearly impossible to locate and can become a hazard if the splice heats up and ignites materials surrounding it.